The longtime customer stars in a series of offbeat spots in a campaign created entirely in-house. 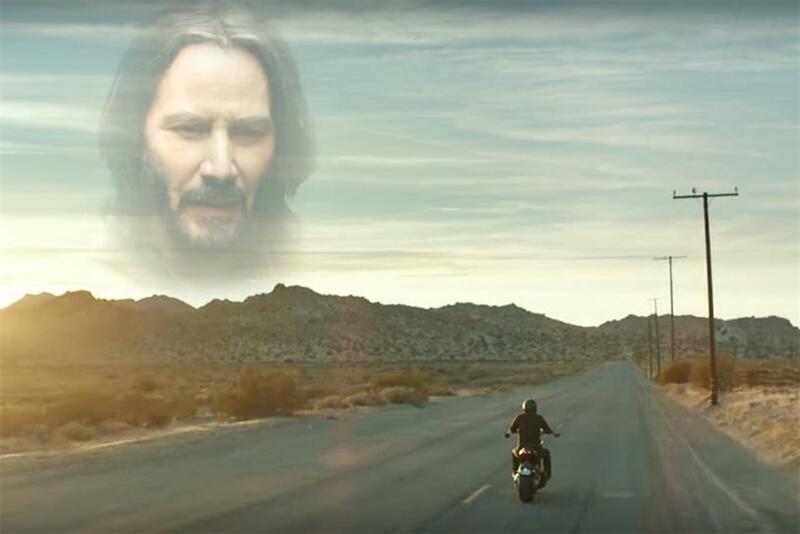 Keanu Reeves is in the desert. He is riding a motorcycle on a long stretch of highway, when suddenly he appears in his own side mirror to dispense advice about starting a website. He argues with himself for a while, and then appears a third time in the sky as a god-like presence to settle the debate. Welcome to Squarespace’s 2018 Super Bowl campaign. In anticipation of its final 30-second spot during the Eagles-Patriots showdown, the web hosting and design company released two longer spots starring the deadpan master. Reeves has been a customer since 2015, contemplating big questions—including what would be the best way to make a website for his company Arch Motorcycles. "We wanted to create a campaign that inspired people to take their idea or passion and make it happen," said Squarespace director of creative production Sandra Nam. "Squarespace has an extremely diverse customer base, including some high-profile customers like Keanu, and we couldn’t think of a better person than Keanu to deliver our message to the world." This is the brand’s fifth consecutive year producing a Super Bowl campaign. After a 2014 debut that skewered the more unsavory aspects of life online, Squarespace’s creative for the big game switched to using offbeat but widely-liked celebrities to strike the right tone. In 2015, Jeff Bridges helped viewers rest easier with his guided meditation "Sleeping Tapes." The next year, Key & Peele hammed it up for an ambitious stunt in which they live-commentated the game but, because of legal technicalities, weren’t allowed to actually reference the game itself. John Malkovich took the reins in 2017 for a spot that won the Best Ad Emmy that year. "The celebrities we feature always lend their own unique spin to the work," said Nam. "For this year’s campaign, Keanu was involved in honing the tone of the spots, and he really made the creative his own." Squarespace made the creative their own, too: this was their first Big Game spot produced entirely in-house; previous editions were in collaboration with outside agencies including JohnXHannes, Anomaly and Wieden+Kennedy New York. "Over the past two years, Squarespace has relied less and less on traditional agency support," said Nam. "Not only do we have a growing in-house team, but we’re also more comfortable with who we are as a brand and what we want to create." Since 2013, the company has had its own chief creative officer, David Lee, who previously worked at agencies like TBWA and W+K. One thing Squarespace is confident in as a brand: going big. While some brands may opt to air around the game, or focus on digital, Squarespace is committed to participating in the high-profile (and high price tag) prime time for maximum impact. "A Super Bowl campaign offers an indispensable opportunity for engagement, acquisition and social impressions," said Nam. "The life and impact of a Super Bowl campaign extends well beyond the 30-second spot." Especially when it stars Keanu Reeves.